Have you ever wondered what makes a high quality guitar sound so much better than other guitars? Here at Reverse Tension Guitars, we have mastered the key to making amazing sounding instruments and are not afraid to do things a bit differently than the way it‘s always been done. There are many factors that influence the sound of a guitar, from the wood selection to the shape, size and structural makeup of the instrument. If we look at the guitar in it‘s most basic form, it is simply a wooden chamber that makes sound by the moving air pressure inside caused by the movement of the soundboard. Herein lies the crux that guitar makers for centuries have been trying to figure out: How do you allow the top of the guitar to resonate as much as possible while not sacrificing the structural integrity of the instrument? 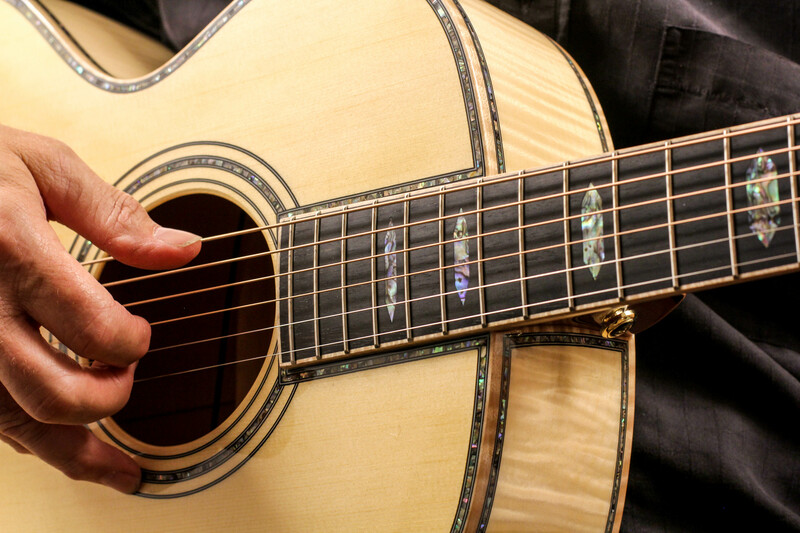 Bracing is needed to strengthen the guitar‘s structure so that it can withstand the tension of the strings. While these braces serve an important purpose, they also naturally inhibit the surface‘s ability to move, thus reducing the guitars potential to resonate. We have applied years of research and inovation to solving this issue. We found the solution in out patented Reverse Tension bridge system which counteracts the tension of the strings and allows for strategically reduced bracing. Because of our Reverse Tension bridge system, our guitars have the ability to resonate unlike any other guitar on the market.